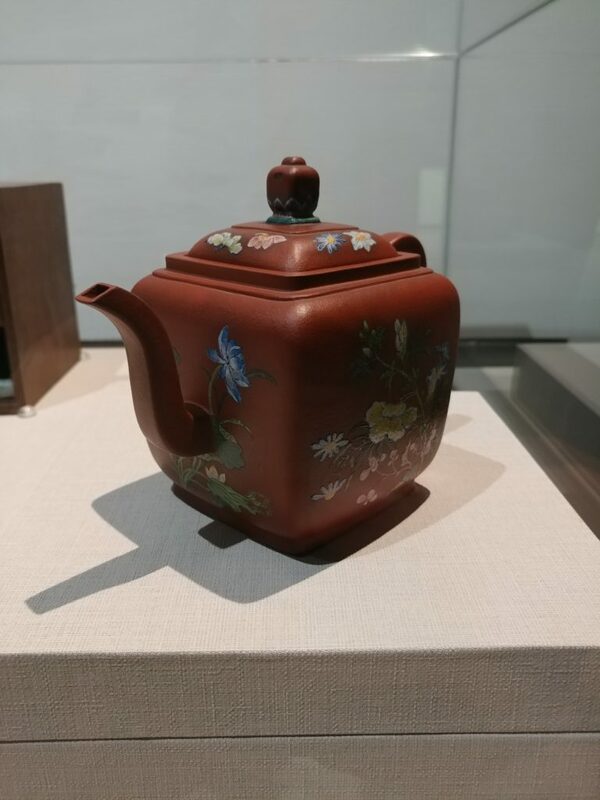 This is from the National Palace Museum in Taipei, dated to the Kangxi period. This pot is part of the imperial collection – probably for use in the palace for whatever it is they fancy. It has some very nice enamel decoration on it, and supposedly a box was created in the Qianlong period for this item, although the box is now lost (in the back you see the corner of a box for something else). And, it’s big – probably a 400ml size. In the years I’ve been drinking tea, every so often, usually on the road, I would resort to some kind of bottled tea for a quick caffeine fix when it’s not practical to do anything else. One of these occasions is when going to some library or another – like during my recent trip to the National Diet Library in Tokyo. There’s basically nothing around there, so your food and drink needs are all served by the canteen on the top floor of the library. There’s also a little grocery store that sells drinks. Since drinking hot tea is rather impractical there, bottled it has to be. When I go to these places, I normally buy some kind of oolong tea – it’s more palatable than bottled green tea, which are invariably some kind of nasty. In Japan, bottled teas are by and large not sugared, whereas even here in Hong Kong sugared variety is more common, leading to a really gross mix. So, non-sugared oolong tea is what I normally end up with, and they are generally really heavily roasted tasting things. Serviceable, nothing more. Except this time, I saw something new – all the bottled oolong teas are now “made in the country” as in made in Japan. Whereas previously they were usually from China, this is I think the first time I’ve seen a Japan made bottled oolong tea. And it shows – the taste is different. I’m sure they try their hardest to make it pretty much exactly the same, but it’s not. You can taste a bit of that Japanese tea in the taste. The marketing is also interesting – they’re saying they brought over the technique for making oolong in China, but also keeps it fresher and better because it’s made in the country. Some of the tea is grown in Yakushima – an island south of Kyushu. It’ll be interesting to see what else is made on Yakushima. Does that mean that we will start seeing oolongs more from Japan – not just in bottled form, but for real? Currently I only know of one farm that seems to consistently push out oolong teas in Japan, located in Miyazaki. They’re decent, although nothing compared with Taiwan. I’m curious to see what will appear. The fun thing, of course, is that these producers – the major beverage manufacturers like Kirin, Sapporo, Coca-Cola, etc – always try to come up with new products every so often. Every spring there’s going to be a bunch of expensive shincha, taking advantage of the craze with new tea every season. And with these oolong teas there’s always new varieties that they try to push, like this one. There are a few reasons I haven’t been updating much on my blog recently. The most basic one is I moved recently, so a lot of stuff got moved and many of my teas got moved offsite, because it’s easier to manage that way. The more important one is because of the big Photobucket blackmail issue. I have been slowly converting all my old Photobucket links to instead hosting the photos on my own blog, which is a slow process unfortunately. However, the biggest reason is because I just don’t have a lot of very interesting things to say these days about tea. I mean, what haven’t I already covered in the 10+ years that this blog has been alive? Sure, I can update on some topics, and there are new things that happen all the time, but really, most of them are quite similar to what have come before. There are very few genuinely new things that I encounter these days with regards to tea (there’s one new black tea that I got a hold of recently that I will talk about at some point). I also haven’t been drinking much new tea. After all, there’s only so much tea one can drink, and there’s plenty of older teas now that I have bought years back that are now at least drinkable. I’ve reached the point where I’m not really in the market for much new tea anymore – there’s really just no need. Why should I sample a whole bunch of new tea when I’m not interesting in buying almost any of them? It’s always interesting, of course, to do so, but that interest is tempered by the fact that many of them are usually terrible, or at least not great. When I can drink something that is great now, versus the high chance of having something that really isn’t very good (and often overpriced) …. the choice is obvious. So I suppose that’s a pretty unsatisfactory explanation. I know if I were living in a city with a more interesting tea scene, I may be out drinking tea more, but then, having two kids will always crimp your style that way. The way the current market is though with tea, I just don’t see myself being that interested in buying anything much – and the few things I do buy, you can’t get easily online, making it a bit of a difficult thing to talk about where I’m basically talking about a pie in the sky. In case you’re worried though, I do intend to keep this blog around, even if it costs me in hosting fees and what not. A lot of discussion of tea related things have moved from things like personal blogs to social media of various sorts, with some facebook groups being particularly active, and at least a few slack groups that I know of. There’s a problem with all those conversations though – they’re fleeting. Once done, trying to find it again is next to impossible, even if you yourself participated in it. Quite often people would tell me that they recently discovered my blog and have gone through a lot of my older posts, and have found them useful. You can’t do that with social media posts, not really anyway, and there’s almost no way to actually save any of those conversations unless you do some serious work to keep an archive of them, which is very unsatisfactory. This blog is by no means an authority on anything, but I do think some 10 years of tea writing is worth something. That’s the reason why I will bother to go through all my old posts to migrate the photos over, even though many of them are of tea reviews years ago for teas that nobody can find anymore, and for which my opinion is probably largely outdated if not completely invalid at this point. I guess that’s me being a historian, but I will at least try to keep the record straight. I do, however, need to continue documenting my teapots, and have been lazy about it after the move even though it did give me a pretty good idea of exactly how many I have. So, in the absence of more interesting posts about tea, you can probably expect to see more teaware in the near future. This blog is sometimes about stuff you don’t even know you need to know. Here’s one – how to store teapots. It’s usually not a problem, until it is. When you have three or five teapots, just putting them on a table and laying them out is good enough. When you have a couple hundred, that tactic doesn’t work that well. 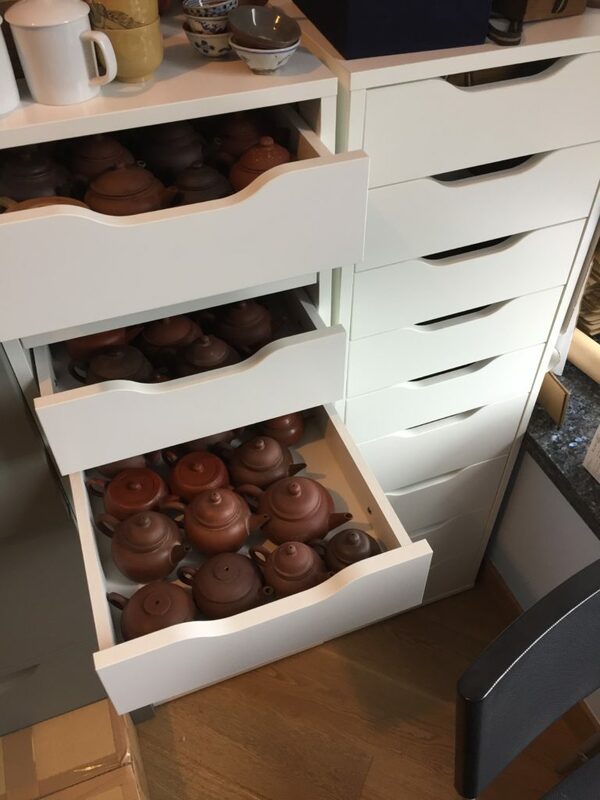 The main problem with storing teapots is that you want them accessible, you want to be efficient with space (at least in Hong Kong) and you want to be able to be relatively sure that they are safe when you open it and take something out. The nice thing about these drawers is that the small drawers are almost perfect for smaller teapots in terms of height. When you open you see most of the drawer, and you can pull out the teapot vertically. If you put it on a shelf, for example, you can easily bump into another teapot and cause something to fall out the front. With an open top drawer, you don’t worry about that. If you live in an earthquake prone area, well, this might not well as well, but I don’t think any storage solution is going to work well for that. The bottom drawers are deeper, so I can fit the bigger pots and also boxes in there for my pairs of pots and things like that. So far I have two of these filled. I could use a third, I suppose, since I have cups and stuff to store, but I’m trying to avoid another one because more space = invitation to get more stuff to fill them. Anyway, if you need a storage solution for your teapots, you’re welcomed. No, IKEA didn’t pay me. As I moved recently, I dug up more teaware that haven’t been touched for years. There are pots, cups, saucers, etc, that I will be posting in the next few weeks. Here are some cups and similar items for a start. You can find the page for garage sale here. This is a picture from my friend L, who is visiting Yiwu again this year. He’s been going for some years now, the first visit of his from 2007. He said when he first went to Yiwu, this tree was supposed to be 600 years old. It was just growing in the wild, one of the older trees, but certainly nothing too special. A few years later, in 2012 when he visited this spot again, the tree was now 1400 years old, not 600. By then, it had been “protected” with this metal cage you see surrounding it, and also some concrete poured around it to help protect it from, presumably, falling off the slope or something. Fast forward a few more years to today – as you can see in the picture, the tree is either dead or about to die, with no leaves and no real sign of life. It’s not the first tree like this and won’t be the last. Nannuo mountain had a similar, much bigger (physically) tree that was also “protected” and died in the process. But fear not – there’s already a newly crowned “1000 years old” tree at the front of the village with a sign hanging from the tree proclaiming so. Tourists who are entering the region need not worry – they will still be able to see 1000 years old tree and buy magical leaves from them! Now, aside from the utter absurdity of the story and the sadness of it all, I think it’s safe to say that those of us who have watched the puerh market for a decade or more know this sort of thing has been going on for some time now. The ever-increasing age of certain trees is not surprising – it’s been that way since at least 2005, when people first started getting crazy about older trees. Prices for the leaves have never really fallen since then, and now ever-fancier things are happening, with single tree cakes being pressed, etc. Just look at this tree though – how much tea do you think it can realistically produce? It’s no taller than a person and half. Even if you chop down the entire tree and took down all the leaves when it was in full bloom, chances are it’s no more than a couple kilos when fried and dried. That brings us to a more salient point – this area of China has never, ever been rich. For pretty much its entire history, human beings living in these mountains have lived a subsistence lifestyle – they produce enough to sustain their life, but not much more. When tea traders first visited these areas in the early 2000s, conditions were primitive. Huts were shabby, sanitation basic, food, while they exist, were not exactly free flowing. In earlier decades many farmers actually chopped down their tea trees to plant rubber, because rubber trees offered a more steady income. Old tree tea was cheaper – they were considered less good back then, and more troublesome to harvest. Prices only really reversed starting somewhere in 2003, and hasn’t looked back since. So in the face of this sudden rush of fortune, it is not a surprise that farmers in this area would want to exploit it to the full. This is, after all, their one chance of getting comfortable, even rich if you were one of those lucky ones to live in a famous village like Banzhang. You can finally make some decent money, send your kids to school comfortably, buy some creature comfort, build a new, better house, get a motorcycle or even a pickup truck. You can have some money in the bank, and enjoy life a little more. If the cost of all that is, say, the over-harvesting of some trees in the slopes above your house…. that’s ok, no? These trees finally will pull them out of poverty, and with an endless supply of newcomers who don’t know that much about tea, business is good. 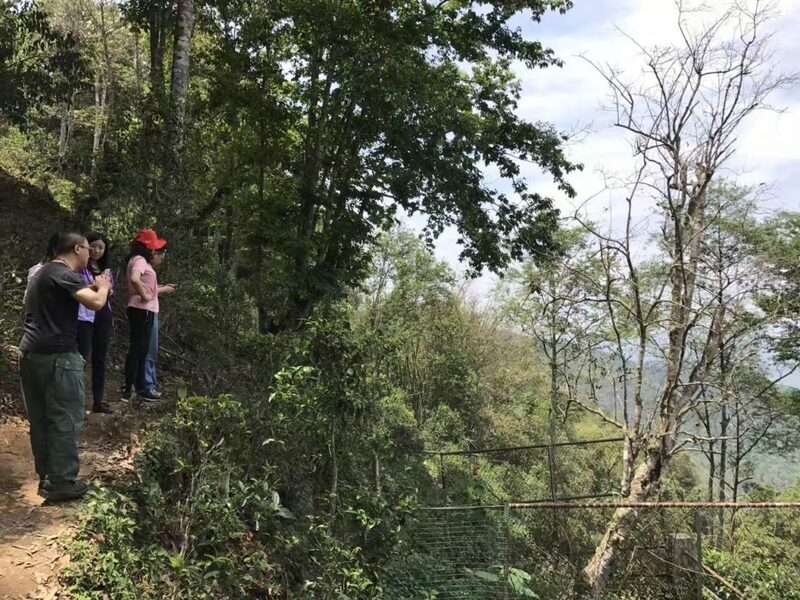 In the last few years as tea-tourism has increased exponentially (I read one account that said this year 500,000 people are visiting the tea mountains during harvest season) there is an increasing number of people who really have no business going to the mountains in there, buying tea. If you are a rich, city professional interested in tea, and are spending a couple weeks in Yiwu looking at things, well, you would want some of your own tea, no? Here, here’s some tea from my 800 years old tea tree. That bag there? It’s the 600 years old one. If you are visiting only that one time – you’ll want to get your hands on some of these things. What’s a few thousand RMB for half a kilo of tea? It’s the memory that counts, and you can press it into a cake or a couple cakes and store it forever, knowing that you personally went up to the mountain to press these unique, old, single-tree cakes. At that point, does it actually matter what trees these leaves are from? These guys are just buying tour souvenirs. It can be trash tea and it won’t matter. And a lot of it is indeed trash tea sold to people who really don’t know what they’re doing when buying maocha. When you compare a few bags of tea, one of them will always be better than the others. That doesn’t mean the bag is good, unless you really know what you’re doing. Most people have never really tried really fresh maocha enough to know the difference. Eager customers from faraway places who don’t get to go to Yunnan easily are also lured in by the same promise. Like this tree that magically went from 600 years to 1400 years old – outlandish claims exist, even among vendors whose primary customer are in Western countries – and people buy them hoping that they, too, can experience these amazing teas. Let it sink in for a moment how old those trees are really, and think about how likely it is that these claims have any semblance of truth. Meanwhile, spare a thought for this tree that perished in the process.